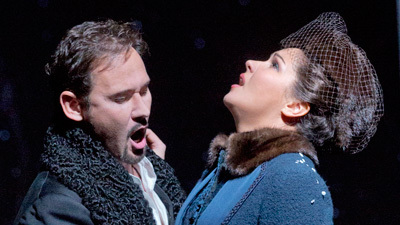 When Deborah Warner’s production of Eugene Onegin opened the Met season in 2013, soprano Anna Netrebko had only recently begun singing the role of Tatiana; however, when she returned to the part at the Met a few years later, her dramatic approach, like that of the character herself, had grown over time. With a smoldering vocal performance, Netrebko embodies the nuanced aspects of Tatiana’s personality—growing from a girl in the blossom of youth into an elegant, cosmopolitan princess. Opposite her, Peter Mattei sings the title role, a nonplussed aristocrat who discovers the power of love too late, with a rich, supple baritone. As the ardent poet Lenski, bright-voiced tenor Alexey Dolgov offers a heartbreaking portrayal. Elena Maximova is Lenski’s carefree lover Olga, and bass Stefan Kocán delivers a moving performance as the aging Prince Gremin. Maestro Robin Ticciati leads the Met Orchestra and Chorus in a textured reading of Tchaikovsky’s beloved score.